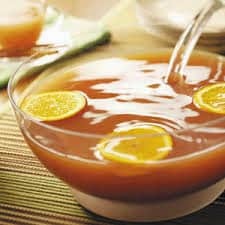 Wassail is a wonderful warm drink to serve your guests before Thanksgiving Dinner. Holiday Wassail is made in the crock-pot and can be served straight from the crock-pot. Thus making it the perfect sipper to serve at gatherings. When your guests arrive, they’ll enjoy a warm cup of Wassail when they come in from the cold. Wassail in a Crock Pot is made with Pumpkin Spice Liqueur, which gives it that extra something special. If you’d prefer to make this Wassail non-alcoholic, omit the Hiram Walker Pumpkin Spice Liqueur. Then simply double up on the apple cider. Wassail is so much better made with apple cider in my humble culinary option. Apple cider has a deeper, richer, apple flavor. Head to your local apple orchard and pick up some hand-pressed, fresh apple cider. Look for pasteurized apple cider as well. Pasteurized cider has been heated to around 158 degrees Fahrenheit (70C) for about a minute. Unpasteurized cider has not. Pasteurizing cider basically will kill any bacteria or germs that might be found in the cider. This process will allow the cider to last longer too. If you choose to purchase unpasteurized cider, just heat it up to 158 degrees for 1 minute when you get home. It’s really that simple and easy. Perfect served on a chilly fall evening. In large crock-pot, add 2 cups Pumpkin Spice Liqueur and 1/4 cup brown sugar. Stir. Fill crock pot with apple cider. Stir. Add whole cloves, 2 to 4 cinnamon sticks and float lemon and orange slices on top. Cover. Heat on High for one hour. Turn to Low to keep warm. Add more apple cider and/or pumpkin spice liqueur as needed. Hiram Walker Pumpkin Spice Liqueur was used in this recipe. Like Pumpkin Spice?? Like Autumn?? Give these recipes a try. Easy Pumpkin Shaped Cinnamon Rolls, Apple Pie Moonshine, Pumpkin Spice Chocolate Chip Amish Friendship Bread. and The Great Pumpkin Cake.